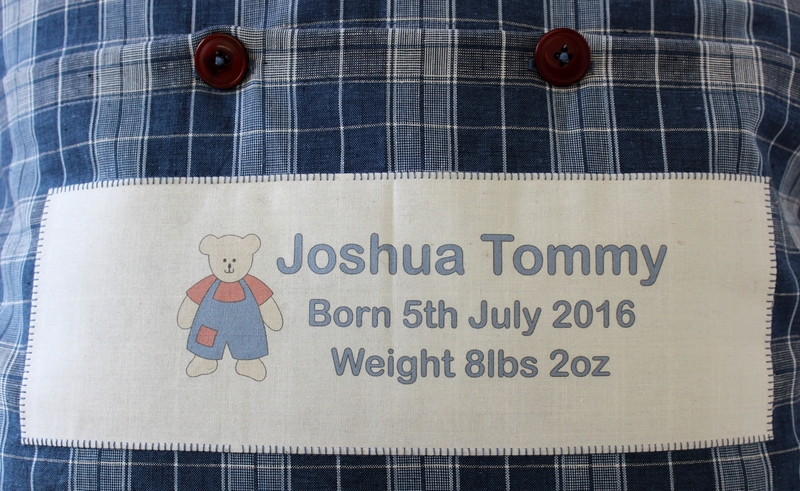 This little chap is very dear and lovely to me, and sometimes his Mum lets me borrow him…So I was especially pleased when she asked me to make a cushion for him, to commemorate his birth, with his birth date, name and weight. First thought for me, the place at which I start every project is Colour. What colours do I want to work with for this project? 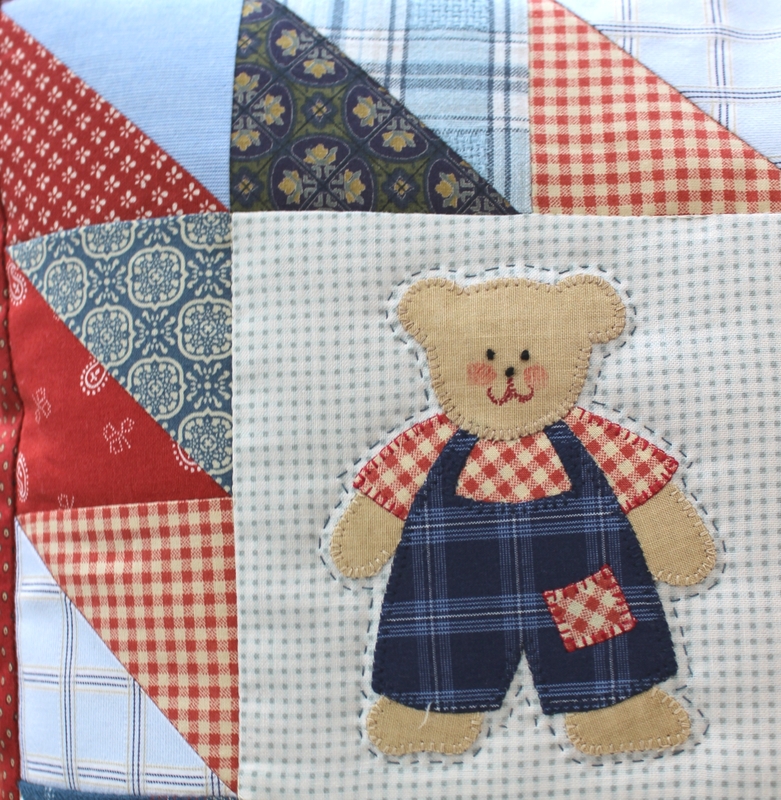 My thoughts turned to a little stash I had up in my tiny sewing room, of some fresh Americana -style reds and blues, clear colours bright and cheerful for a little boy to enjoy. Getting them together, giving them a press and a re-fold gives me ideas, looking at the sizes of the pieces, of how I will piece the cushion. I really enjoy this part, which is essentially the choosing of the elements. Some people find it very stressful, especially if they’ve got to out and buy everything, not I, it’s the best bit! And a good reason to run a copious stash! Some of the pieces I keep are tiny; but enough to make a couple of hearts or a pocket – they don’t take up much room and they give me an extensive palette. 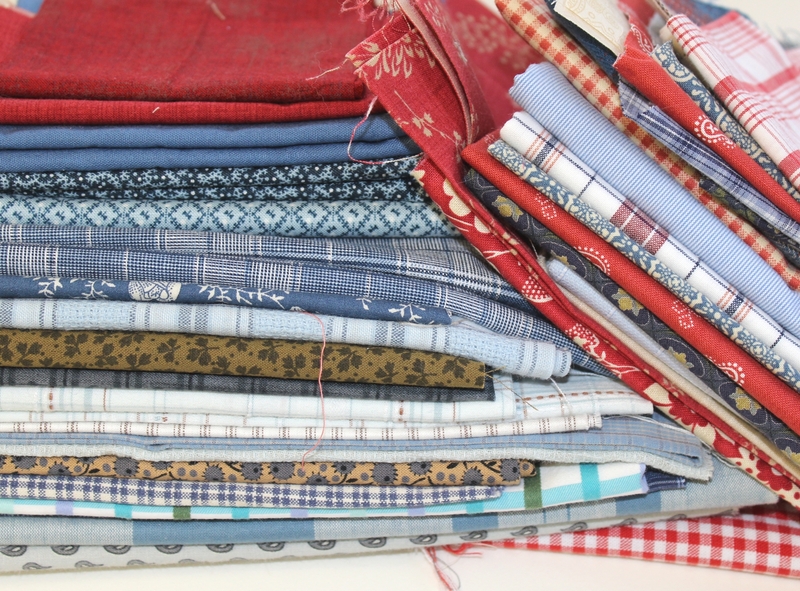 I chose 12 fabrics, 6 pairs, which yielded 12 squares of each size, enough to make the quilt and the cushion, in my estimation. I never mind if I make too many of things, they invariably come in handy! Here is a selection of bits and bobs, a proto-type bear from the book I told you about earlier, my version to come. 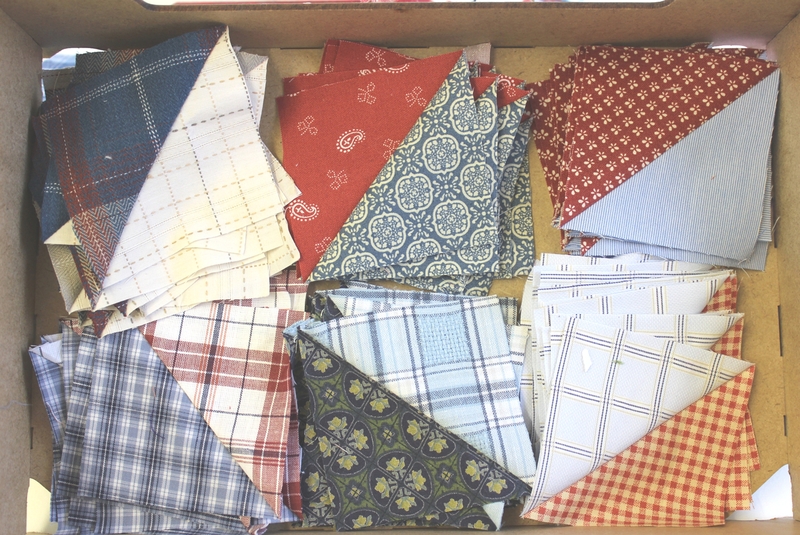 And some finished half square triangles and one set in progress. The advantage to sewing them through the paper is that the bias diagonal doesn’t stretch at all, as you sew first, cut after. 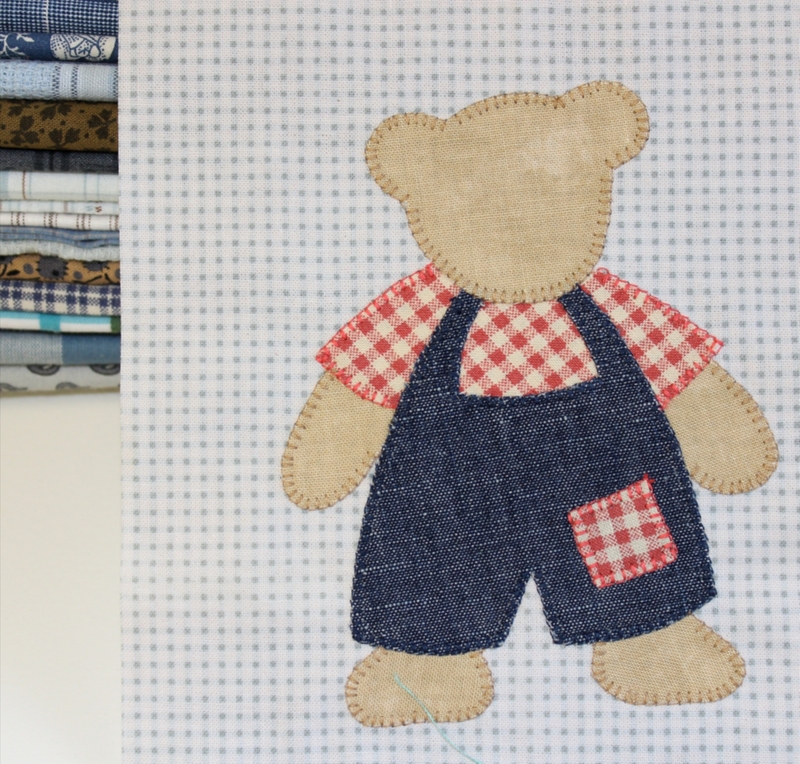 So it makes for very accurate piecing…Don’t know what I’ll do when my last bit of bear fabric is gone, the textural print is so soft and right, but what’s left is tiny! This is my drawing of a boy bear, made up partially but for the detailing on his face. He’s a little bit like his cousin, but he has a bigger head, shapelier feet, a pocket for his Smarties and also a Summer shirt! Soon he’ll have a sweet little face, rosy from being out in the woods, and with a big smile! The last image for today’s post is one of the back of the cushion, so you can see the computer printed label blanket stitched to the back, underneath the button closure. Smart, eh?! 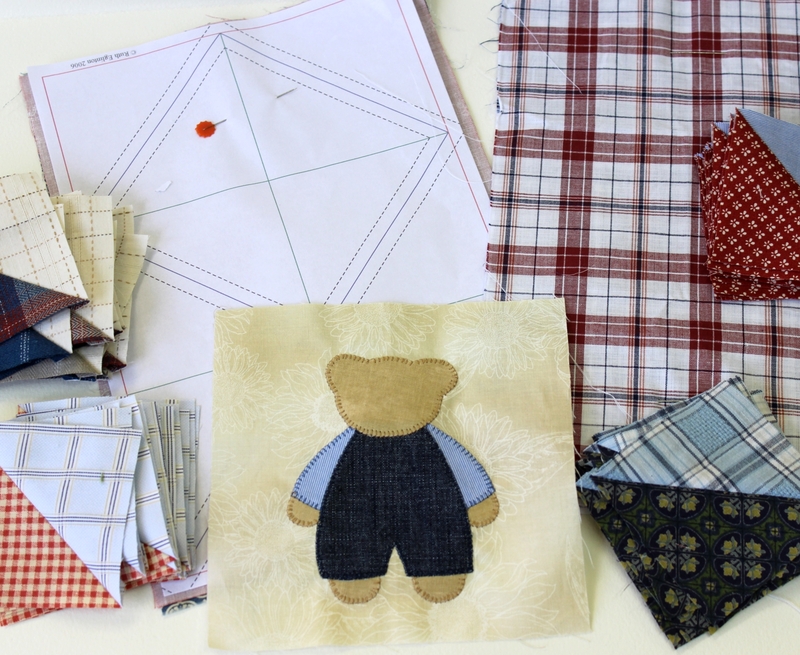 Will be doing a Teddy Bear’s Picnic Workshop one day soon, bears must be brought, and I’ll make the picnic. 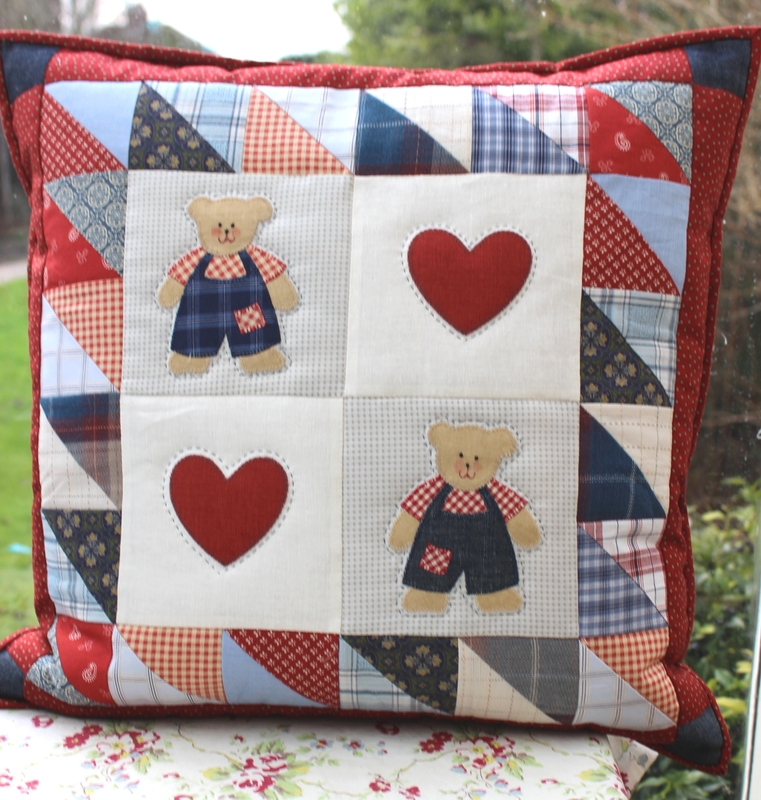 You can stitch up a brood of bears for yourself! It’s really lovely Maggie – well done you! 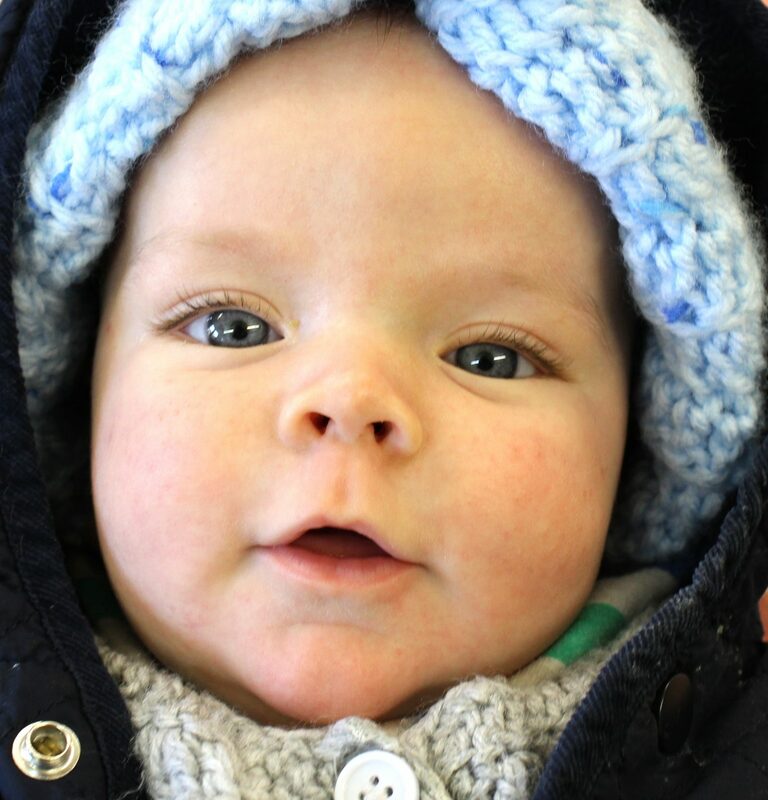 And what a beautiful baby Joshua is too. Glad that you like them, there will be a pattern soon.